When it comes to accomplishing his goals, Josh Yingling is no stranger to hard work and dedication. Josh, owner of Dallas-based businesses Goodfriend Beer Garden, Goodfriend Package, and The Blind Butcher, knows the importance of being on top of his game when making his goals a reality. That is exactly the work ethnic he used in putting together his long-time vision, which started as a 1971 Triumph Tiger. 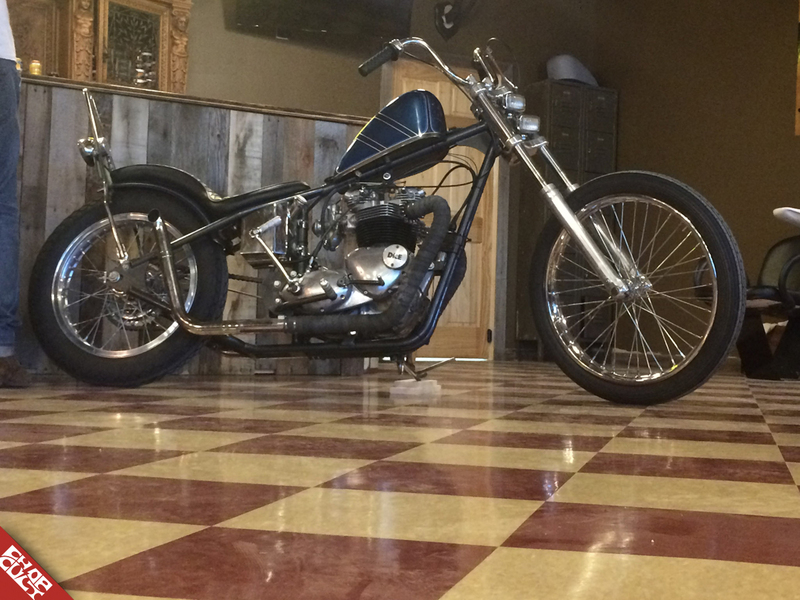 Josh started the tear down at his shop, Lucky 7 Cycles, and the build was well on its way. He started by pulling and rebuilding the motor and, between himself and Big D Cycles, the motor was finally completed. 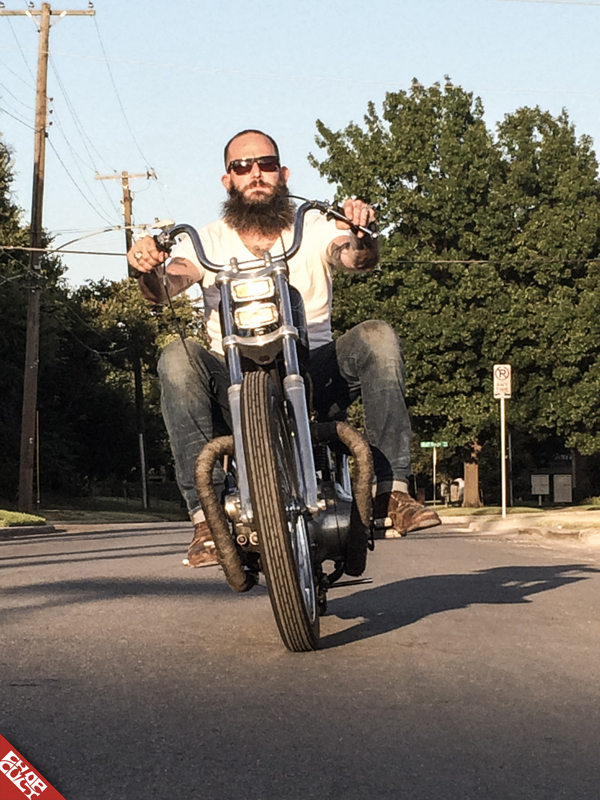 The motor waited patiently on the work bench until it was ready to be placed in the TFMW frame Josh snagged from Todd Asin of Small City Cycles. Next on the agenda, Top Koat powder coated the frame, and then it was off to the races. 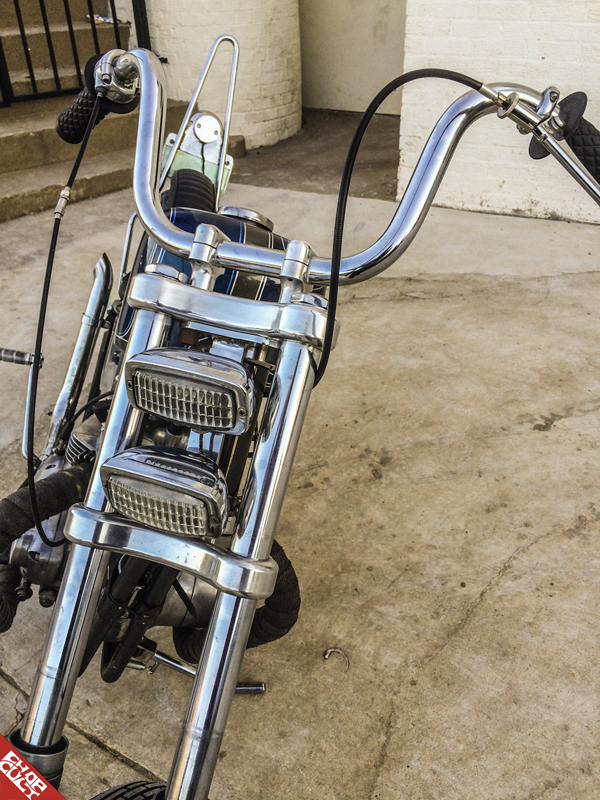 Josh took his skills to the next level and, using left over pieces, he built a killer set of exhaust pipes for the overall narrow look he was trying to achieve. A narrowed set of Mullins 35 mm trees and some shaved lower legs completed that clean, simple look. Josh decided on a 21 inch spool wheel up front and a 19 inch rear wheel to keep the look simple and skinny. He finally had the roller he desired and, as many of us know, the real soul of any build comes when you see the foundation sitting in front of you. That is when your true individuality and vision comes to life for the final version of the build. Josh does not consider himself as a builder, but he decided to do as much of the fabrication as possible when taking on this challenge. Josh used a ton of parts from Factory Metal Works and Lowbrow Customs and mentioned that both offer some quality parts that made his vison a reality. The parts offered gave him the upper hand in making The Mistress a full quality build. As any of us know, paint can make or break a build. 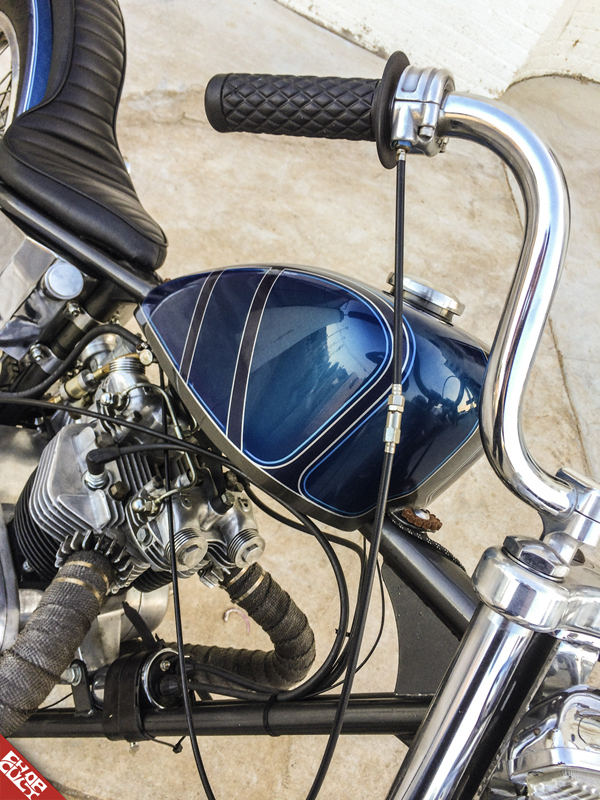 Josh turned to Scott Hoepker of Chemical Candy Customs to lay down the flawless blue candy paint with some added patterns to complete the one-off paint scheme. Once the paint was completed, Josh built a seat pan and then sent it off to Justin Bell, owner of Bells Auto Trim, for a flawless tuck and roll cobra style seat. After the seat was mounted on the bike, Josh could finally step back and see his long time vision sitting in front of him. The final touches were completed, the wiring was done, and then it was finally time to kick his dream into reality. A few kicks later and the bike was up and running and Josh’s long anticipated maiden voyage would soon be a reality. Josh would like to thank his wife, Amy, and son, Oliver, for their ongoing support during the long days and nights during the build. 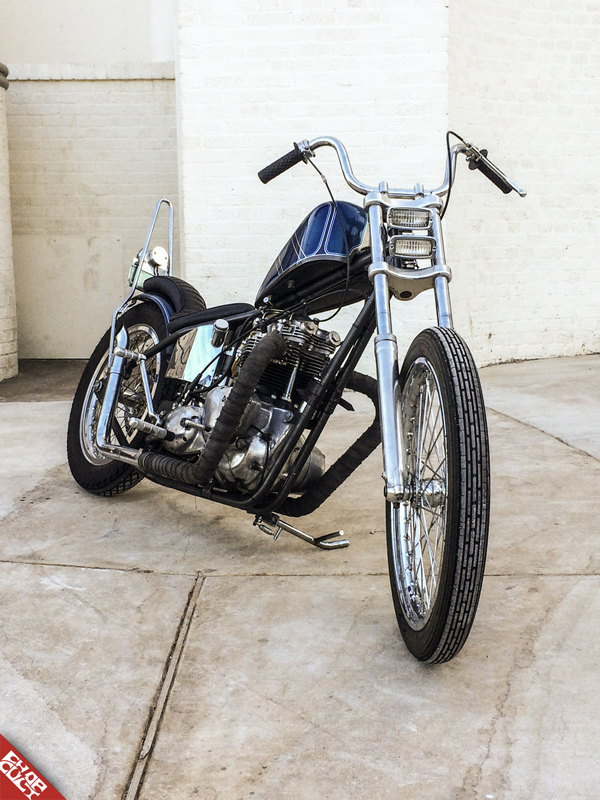 He would also like to thank Scott Hoepker for the killer paint, Four Aces Cycle, Factory Metal Works, Lowbrow Customs for all the tech help and quality parts and, lastly, Chop Cult for the killer coverage and opportunity to share his long-awaited build. 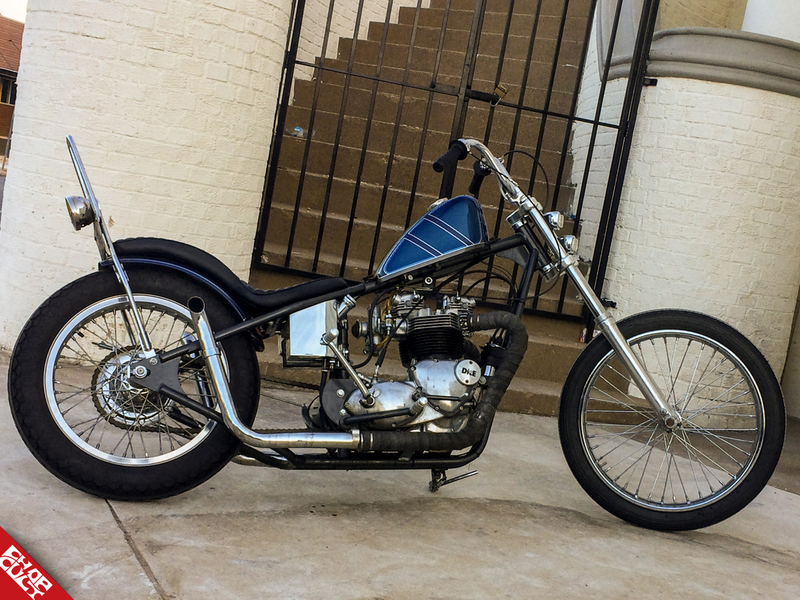 Favorite thing about this bike: Riding and keeping a 45 year old motorcycle alive. Next modification will be: Re-do the oil bag, exhaust, handlebars and possibly convert to a magneto.